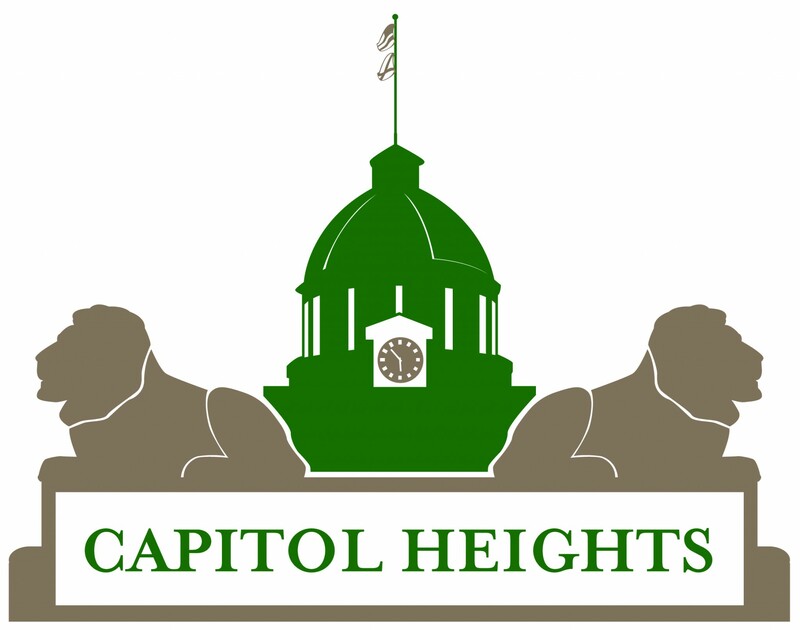 The Capitol Heights Civic Association (CHCA) has existed as an unincorporated association since the early 1980s. It was however only Incorporated with the State of Alabama on July 14, 2011 in Montgomery, Montgomery County Alabama as a non-profit. The Department of the Treasury Internal Revenue Service determined by letter dated January 6, 2014 that we are exempt from Federal income tax under section 501(C) (3) of the Internal Revenue Code. Public Charity Status 509(a) (2). Effective date of exemption is dated July 14, 2011. Madison Avenue in Capitol Heights is the gateway to the City of Montgomery’s downtown renovation project and is a local historically designated Avenue among others in the Historic Capitol Heights district. There is a historic plaque on the property of the Louis Armstrong Memorial Park at 1849 Madison Avenue erected by the Capitol Heights Civic Association (neighborhood association) to commemorate the history of the Capitol Heights Town in Montgomery County and now a suburb of the City of Montgomery, at Waymarking.com. 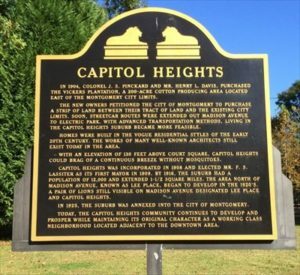 Today, the Capitol Heights community continues to develop and prosper while maintaining its original character as a working-class neighborhood located adjacent to the downtown area. CHCA also erected a plaque on Winona Avenue for the First Elementary School in Capitol Heights Town in 1912 also at Waymarking.com. Louis Armstrong Memorial Park is located on Madison Avenue in the heart of the Capitol Heights community and thanks to the corporation between the City of Montgomery and the Capitol Heights Civic Association exist today as a neighbor park. The property was the site of the home of Colonel James Steptoe Pinckard that formed the Capitol Heights Development Company in 1904. He built his home, Rockhaven, designed by Frank Lockwood, in 1909. Rockhaven burned to the ground in the late 1960s. The steps that lead to Louis Armstrong Park are the original steps to Rockhaven. 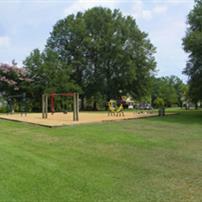 After the fire, the community petitioned the City of Montgomery for the land to become an area park. Louis Armstrong Memorial Park is named after a local doctor and is situated on 3 acres among mature trees with open green space, benches, a lighted pavilion and a playground where the community has events, children can play, or all of our neighbors can just enjoy a day in the park. Vickers park is another beautiful open green space in the Capitol Heights Community and was donated to the City of Montgomery to develop by the Capitol Heights Civic Association. This park has a jogging trail, picnic table, bench, and CHCA recently added a doggie station with bag storage so the community can pick up after their pets, who enjoy having an open space to play and enjoy the park with their neighborhood pet owners. 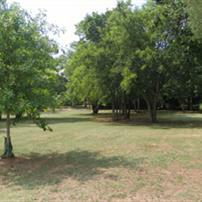 Vickers park is named after the 197 acres of land known as the Vickers Tract owned by and conveyed by Henry L. Davis along with 50 acres adjoining the property to the east, conveyed by Wm F. Melton to James S. Pinckard, Massey Wilson. 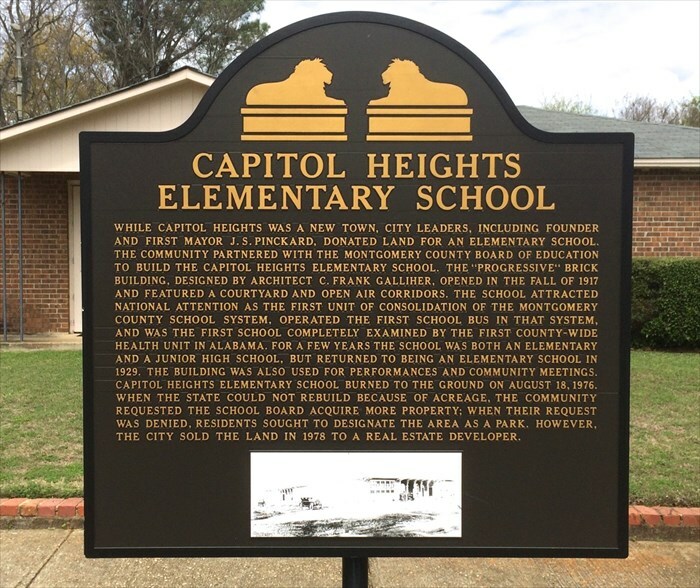 And Albert F. Wilson to form the Capitol Heights Development Company Incorporated. December 14, 1904. The location of Vickers Park at South Madison Terrace was originally named Vickers Street in keeping with the North and South Street names and East and West Avenue names of Capitol Heights. James Avenue the adjoining Avenue. There are also 3 park areas in the median of South Capitol Parkway built to replicate the design of Green Street in Augusta, Georgia. 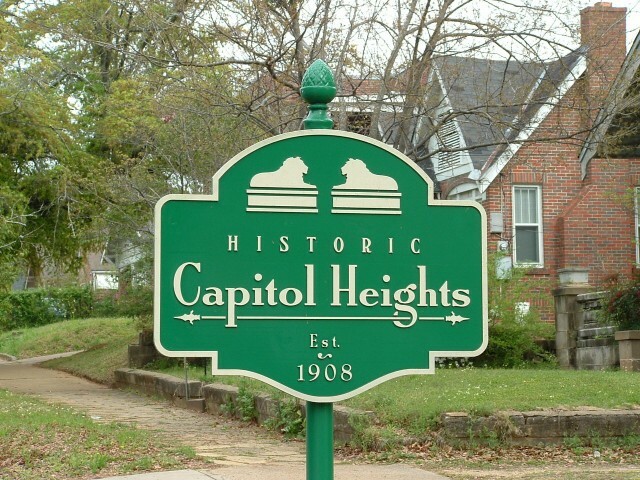 In 1908 Capitol Heights became a town. Lots were developed, and homes built in the circa 1903-1910. Capitol Heights was incorporated in 1908. 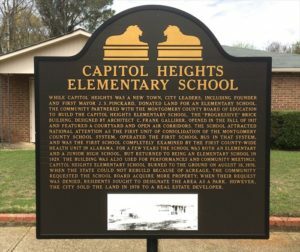 The Capitol Height Civic Association have historic markers on the boundaries of the neighborhood reflecting the Incorporation date of Capitol Heights Town even though the early plat drawings and Incorporation of Capital Heights Development Company was in 1904. Many of the homes were built in the 1920s and early 1930s due to the trolley route down Madison Avenue. 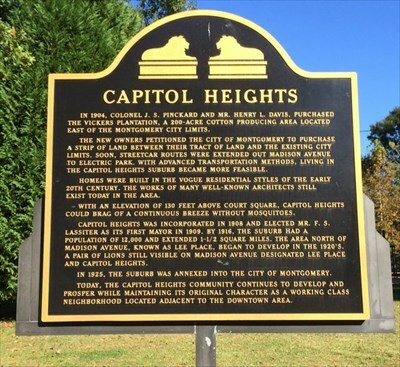 With the advent of the trolley, Capitol Heights became known as a suburb of Montgomery in 1926 and annexed in 1927 by an act of the Alabama Legislature. The structures in Capitol Hill were built in the vogue residence styles of the early 20th century. The Craftsman style of the Greene Brothers in Southern California was an influence on the developers, who altered the style to fit the climate and construction material available in Alabama. Many of the homes built in the 1930s were constructed with lumber from Camp Sheridan, a World War 1 Army camp. Capitol Heights was and remains today a melting pot community. Several Greek families moved in the neighborhood in the early 1900s. The whole community helped them build their church, and they became a cornerstone of the neighborhood. The Greek community remains a vital part of Capitol Heights. CHCA has worked diligently to represent the needs of the community and to advance the historic and educational benefits to the community itself and to greater Montgomery. The Association has a respected reputation as one of cooperation trusted by city and county agencies. In recent years, working with city departments, the Association won a grant to replaced 200 plus trees lost during a hurricane. Recently historic street and stop signs with decorative post where installed along Madison Avenue and hopefully with grants and public donations we will be able to continue the street scape signage throughout the Capitol Heights Community. Capitol Heights NEIGHBORHOOD WATCH was created to help our neighbors learn how to prevent crime in our community and to cooperate with the Montgomery Police department in the detection and reporting of crimes in our area. COMMIT TO MAKING CAPITOL HEIGHTS CRIME FREE -let all criminals know that you are keeping an eye out and you will report all suspicious activities!!! Signs are professionally made (by Mark Fair signs) metal with wooden stakes – made to last!! !